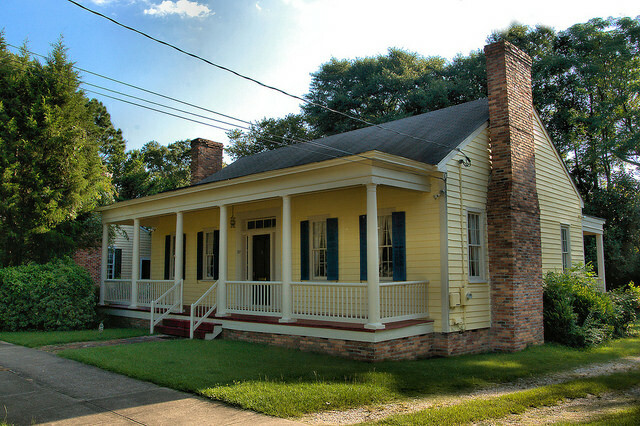 This house served as the residence of Dr. John S. Pemberton from 1860-1869. He moved into this house from the white cottage pictured in the previous post. 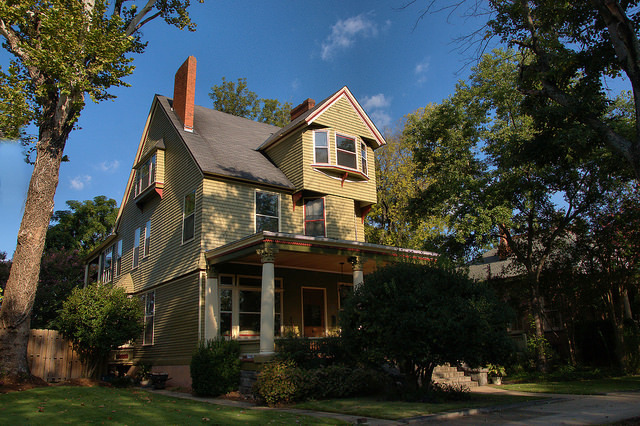 Originally located four miles north of Columbus, it was relocated here in 1977 to afford it the protection of the Columbus Historic District. Dr. John Stith Pemberton is known worldwide as the inventor of Coca-Cola. 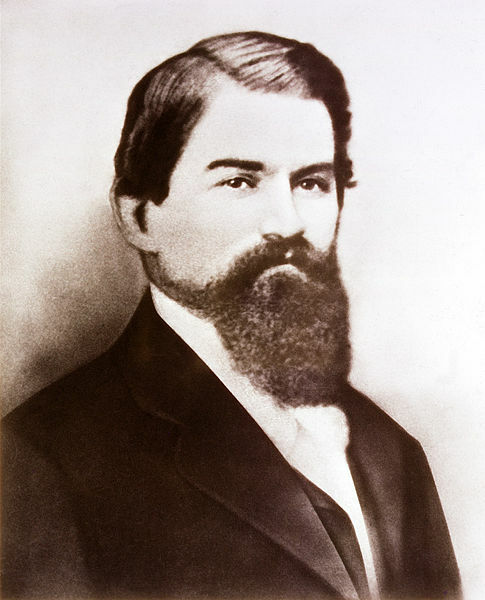 Born on 8 July 1831 in Knoxville, Georgia, and raised in Rome, Soon after he received his pharmacy license he married Eliza Crawford Lewis and the couple moved to Columbus. 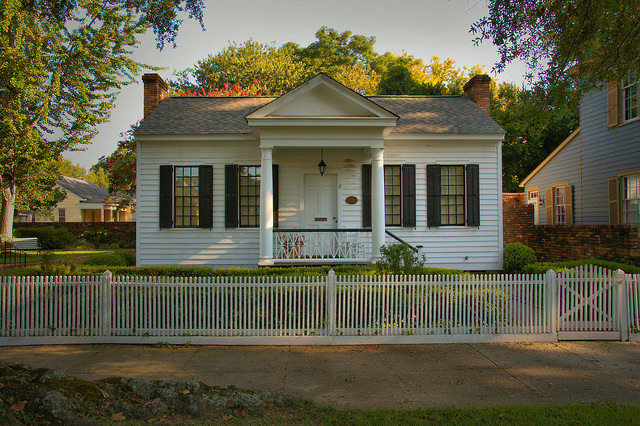 They lived in this house from 1855-1860. I’m unsure if the Greek Revival details are original or a later addition. Wounded in the Battle of Columbus in 1865, Dr. Pemberton in an attempt to alleviate pain became addicted to morphine. In his search for a cure to his addiction came the genesis of Coca-Cola, which Coca-Cola historian Phil Mooney asserts was invented in Columbus, not Atlanta as most assume. The Coca-Cola Company’s website, however, doesn’t concur. Either way, Dr. Pemberton sold the formula soon after he invented it. He died on 16 August 1888 in Atlanta and was returned to Columbus for burial. When Colonel William Wynn built this stately mansion, it was called Oakview. Colonel Wynn, for whom the Wynnton area of Columbus is named, was an early settler of the Lower Chattahoochee Valley. Henry Hurt bought the house in 1852 but never lived in it, selling it to Hines Holt in 1855. Holt was a prominent attorney, as well as a member of t he U. S. House of Representatives. 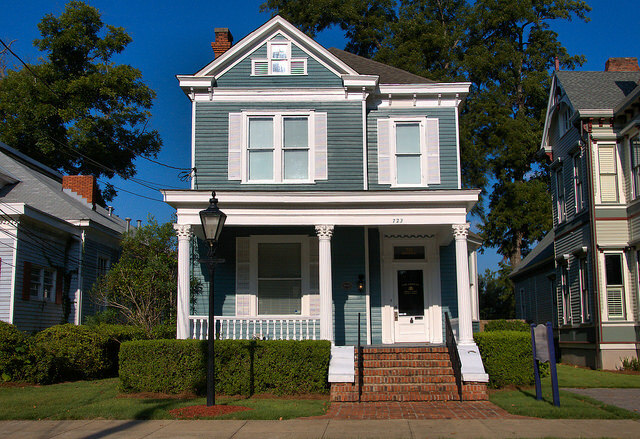 In 1905, Tom Cooper purchased the house and moved it closer to Wynnton Road so the property could be subdivided for other development. 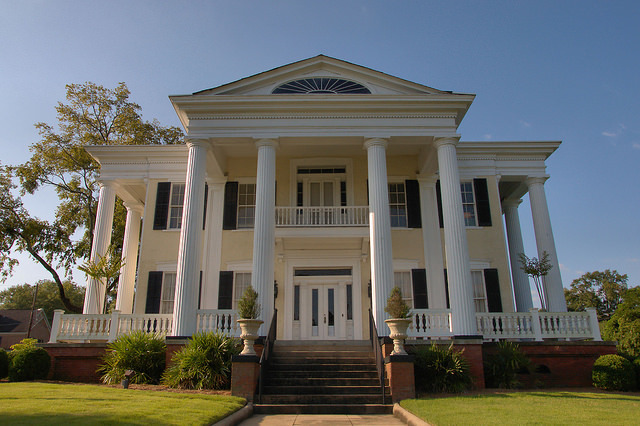 In 1932 the S. C. Butler family bought and completely restored the house. The Christian Fellowship Association moved into this landmark in 1958. Today it’s operated as a membership-oriented event and entertainment space. Tom Darby (l) & Jimmie Tarlton. Real Photo Promotional Postcard, 1927. Collection of Brian Brown. This postcard came into my possession through the estate of a cousin, who was a great niece of Tom Darby. Largely forgotten today, Thomas P. (Tom) Darby [1892-1971] and James J. 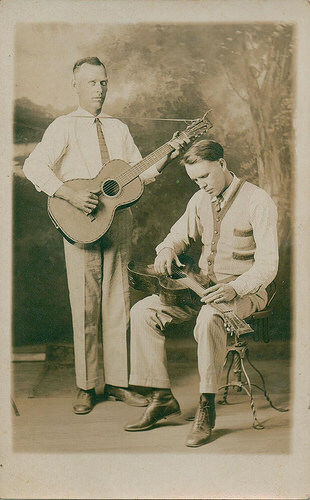 (Jimmie) Tarlton [1892-1979] were considered not only legendary bluesmen but pioneers of country music as well. They’ve been called the first country musicians to employ the steel guitar. Their most famous work, “Columbus Stockade Blues”, has been covered by artists ranging from Doc Watson and Willie Nelson to Bill Monroe, Jimmie Davis, and Bob Dylan. When they made the recording for Columbia in Atlanta in November 1927 Tom Darby pressed for a flat payment of $150 but Jimmie Tarlton wanted royalties. The song took off and sold over 200,000 copies in a short time and though the duo recorded 63 more songs dating to 1933, hostilities over lost royalties finally drove them apart. They reunited in 1965 for a symphony appearance in Columbus but no further collaborative recordings were made. Tarlton, always considered the standout of the duo, did make solo recordings in the 1960s. Search Amazon for compilations, which are available and provide valuable insight into the birth of American popular music. 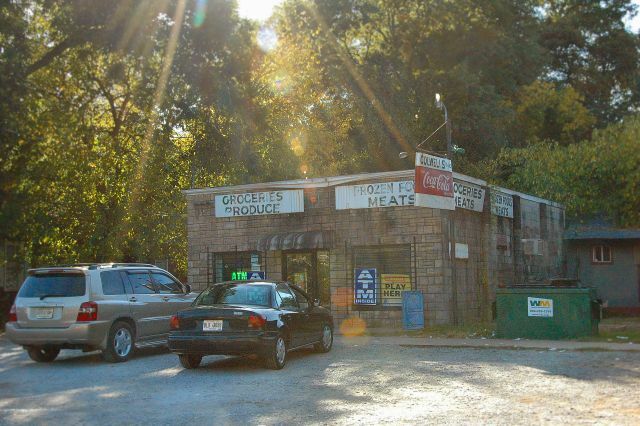 As of 2016, I’m unsure if this neighborhood grocery is still open.